On The Go: Super Green Smoothie | Eat. Love. Namaste. Do you ever wake up and tell yourself → today is the day; the day I make good choices, the day I eat healthy and get into shape! I can tell you that I am that person; someone who knows that I shouldn’t eat that donut sitting on the counter in the break room and go home to watch tv on the couch. Should you blame yourself for not trying, especially if your day was extremely long and rough? Do you ever feel that your decisions and choices start to collide? I use to be in shape, strong, and overall healthy; or at least I thought I was. Over the years, life hits you with curveballs. Then gradually, you start to make less healthy food choices and doing less physical activity. I always try to do something about it, but then another curve ball comes at me, and I’m back into the same old habits. About two years ago, I started experiencing shoulder pain that progressed to where I couldn’t do anything (including carrying a bag of groceries in the house). After seeing a doctor, I found out that I had a partial tear that may or may not heal on its own or with or without surgery. This blew my mind, especially when he said that I probably would not practice yoga again. This curveball drove me down a path of physical inactivity, something my body and mind didn’t need! After all this time, and barely doing any physical activity my pain is now bearable to unnoticeable. I was nervous to get back in the groove. I was scared that if I did one plank, my pain would come back as bad as it once was. So there I was… going on about my day… not doing anything about it. With my days getting busier than ever, working longer hours, I found myself making poor eating choices, along with my little to no physical activity. I have been vegan for quite some time now, but it can be extremely challenging to be a healthy vegan. So, here I am, an unhealthy vegan who doesn’t work out. Yes, some days are better than others, but overall health and wellness is an everyday effort. If we can do one-day-at-a-time, it should show us the reflection of our own possibilities. Even the small changes can turn into great accomplishments. Starting Eat. Love. Namaste. will be my guide to getting back on track → a fresh start. I am making My Decision to turn into a choice of being healthy and in shape. Taking one day at a time! Knowing I can do it! If this sounds like something you want, I know you can do it too! & I hope you find my place here → a place for inspiration, healthier recipes that are good for you from the inside out, and a place to kick yoga into your daily routine for nourishing yourself from head to toe. 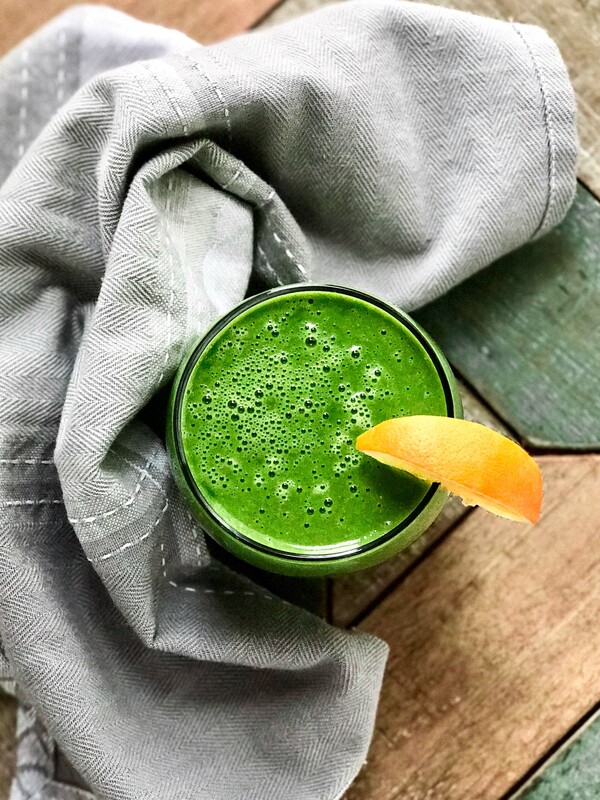 Leaving on that note, some healthier choices that you can make for when you’re on the go is this Super Green Smoothie. 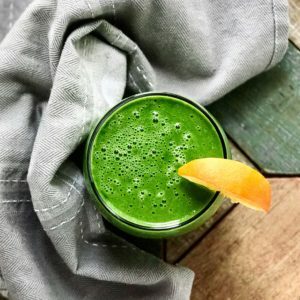 While there are a ton of smoothie recipes out there, I have found this one the easiest to put together that lasts throughout the morning. If you have your own that you make and love, I challenge you to make it every morning until it becomes part of your routine. Your body will love you, and you will notice a difference! A quick and easy smoothie that keeps you energized throughout the morning, or when you are on-the-go!